“We have a strong team, many girls are going fast. We do this together so we are really happy,” Therese Johaug told the International Ski Federation (FIS) after Sunday’s 4 x 5-kilometer relay in Ulricehamn, Sweden. 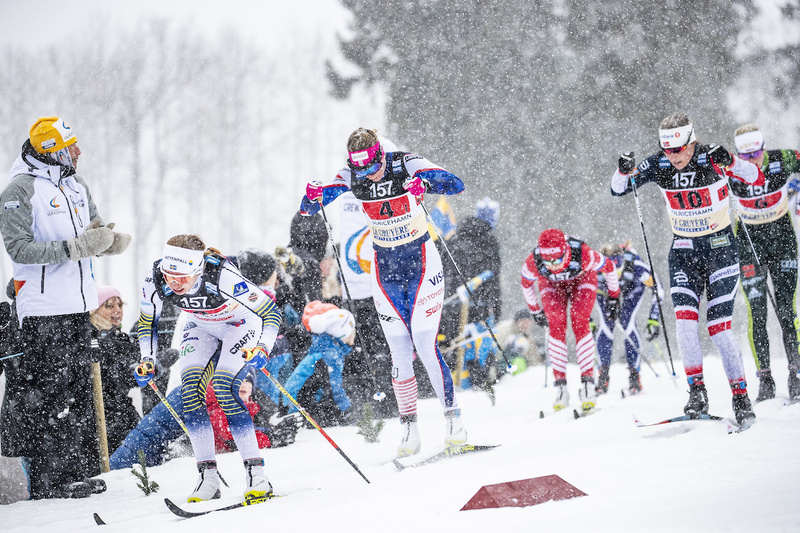 With wind, snow, and crowds lining the course the 4 x 5 k women’s relay appeared to simply be an illustration of Norway’s astounding plug-and-play depth. Sunday marked Norway’s 11th 4 x 5 k consecutive relay win dating back to 2011. Earlier this season, Norway bested Russia in Beitostølen, Norway for the win. 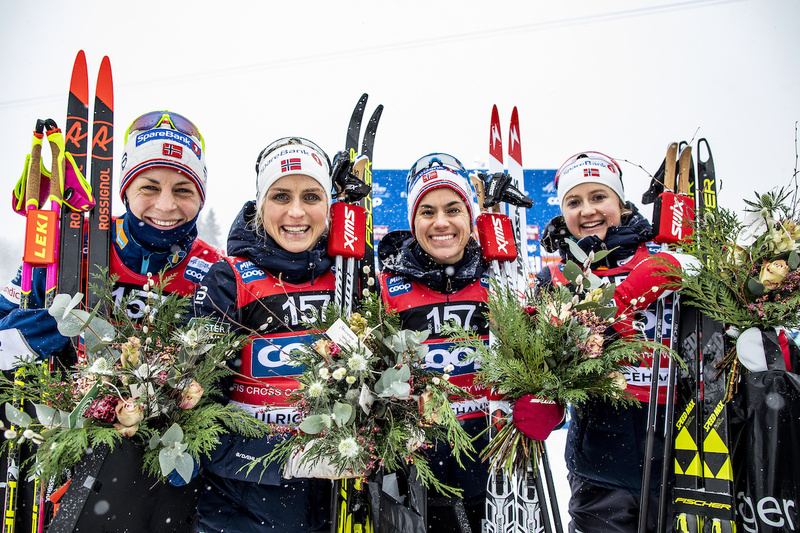 Back in that December race, Norway’s winning lineup featured Heidi Weng, Therese Johaug, Haga Ragnhild, and Ingvild Flugstad Østberg. Employing their luxury of depth on Sunday, Norway simply swapped an in-form Astrid Uhrenholdt Jacobsen for Ragnhild. Jacobsen placed second in yesterday’s 10 k skate. Whether the race is tight, or a runaway, Norway’s benchmark is the win. In 57:06.3 minutes, the winning time on Sunday, Norway I illustrated that over four legs of skiing, they remain peerless. At the first tag after 5 k, Weng came in among a cluster of nine teams all within 8.1 seconds. Russia I was first, Norway I second (+0.5). 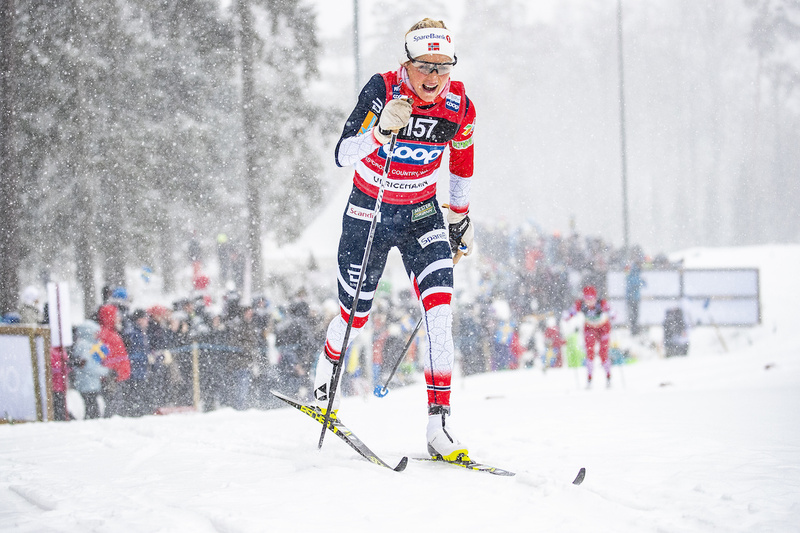 The gift that is Johaug took over for Norway I on the second classic leg. Nothing earth-shattering, but Johaug kept the pace high enough to tag Jacobsen for a 9.3 second lead on chasers Russia I. A bit more than 15 seconds back were Sweden I and Finland I. With Kalla taking over for Sweden I on the initial skate leg, empowered by the frenzied crowds, one could envision a Kalla-catch where she powers and glides into contact with Norway I. That simply did not happen. Kalla’s magic was subdued on Sunday. Jacobsen added more time to Norway I’s lead. As Jacobsen tagged Østberg skiing the anchor leg for Norway I, Jonna Sundling waited 21.4 seconds for Kalla to come through. Five k later, Østberg came through for the win and a comfortable 37.4-second gap on second place Sweden I.
Sweden I’s team consisted of Evelina Settlin, Ebba Andersson, Charlotte Kalla, and Jonna Sundlin. In third was Finland with Laura Mononen, Krista Pärmäkoski, Riitta-Liisa Roponen, and Evelina Piippo. Finland was 41.2 seconds behind Norway I’s winning time. For the U.S., Sadie Bjornsen, Rosie Brennan, Caitlin Patterson, and Jessie Diggins finished in sixth (+1:26.6). The order of the U.S. lineup was a carbon-copy of December’s 4 x 5 k team in Beitostølen. Back then, the foursome placed fifth, 48 seconds back, in what was a tighter race for second and third place. In that race, the U.S. was 10.7 seconds from the podium’s second step. Sunday in Ulricehamn, Bjornsen kept the U.S. in contact, tagging Brennan in fourth, 4.5 seconds behind. Brennan lost some ground, losing contact with chasers Finland, Sweden I, and Russia I. She tagged Patterson in fifth place, 44.9 seconds behind Norway I in the lead. Patterson found herself in that place of fending off skiers from behind and attempting to gap up to those in front. She tagged Diggins at 15 k in seventh, with a 1:20.3 deficit. Diggins kept firing as she skied the anchor leg. Even if a podium spot was out of reach, the immediate task of catching Russia II was her carrot. At the 15 k mark, when Diggins took the team on her own 5 k journey, Russia II has already tagged off roughly 18 seconds ahead of the Americans. 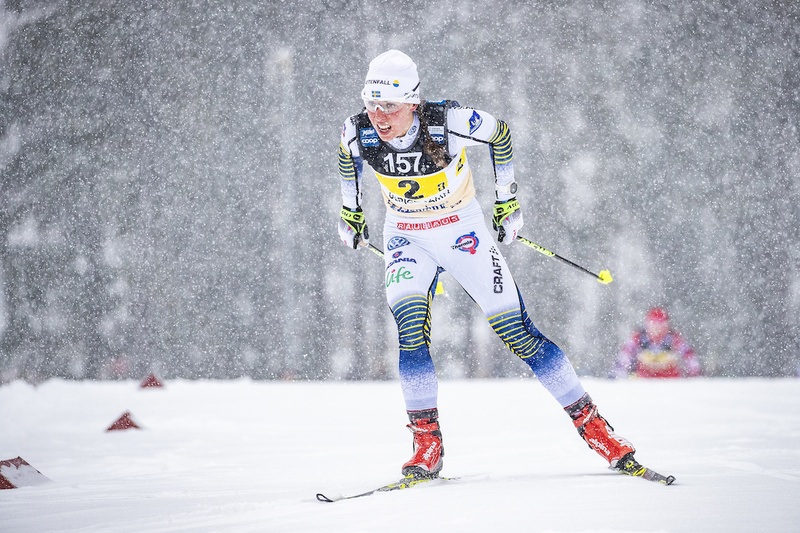 By 17.2 k, Diggins had Russia II almost in contact, and by a kilometer later, she had passed Russia II to gain sixth place. 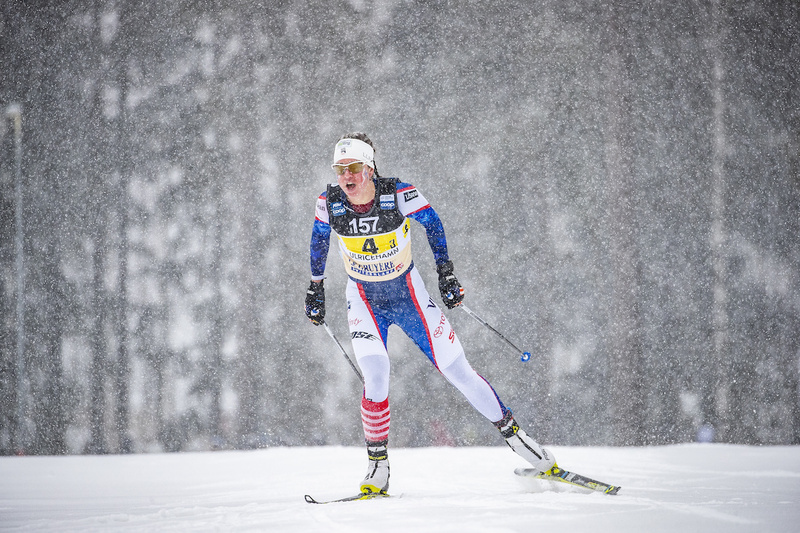 The U.S. was able to put nearly 20 seconds on Russia II, who placed seventh overall, by the finish. The relays are a moment to assess a team’s collective standing on the World Cup — to find areas to improve upon during the podium quest. “Rosie [Brennan], I think she’s wishing she pushed a little bit harder at some points in her race; I haven’t had time to talk to Caitlin [Patterson] or Jessie [Diggins] after the race but I think we had a little bit of what we had at Beitostølen, which was two really strong legs and then two decent legs, medium legs, but we just don’t have quite the four extraordinary legs to put together right now to stay in the mix as long as we need,” U.S. Ski Team Head Coach Chris Grover explained in a post-race phone call. The nature of powerhouses like Norway in the women’s field is that reality reveals itself with large sample size datasets. Eleven wins in a row are, within the world of World Cup skiing, statistically significant. Even more, all four members of Sunday’s relay team for Norway I placed in the top-8 in Saturday’s 10 k skate. In the quest for relay podiums, none of this is lost on Grover, who remains optimistic and grounded in the U.S. quest to remain podium viable in the 4x 5 k relay. Asked if Norway’s power comes into the calculus when planning for relay day, the longtime coach kept the tangible goal of catching second and third place as the benchmark. The World Cup takes a break from racing and will commence again in Lahti, Finland on Feb. 9.